Nice event [good battles with: A Rus (good careful driver) and especially most of the time with Rene L., + indirect battles by following Gilles, Graziano,.. at some certain time on track]. At least I was almost satisfied with some of my qualy laps (tired three setups in qualy: with low, mid.-low and mid-high wing, the second one worked best). In Interlagos it is possible to use less front wing than normal (and alter the rear instead, to keep balance still the same) -with the KS2 that works here-, but unfortunately I did not try that at this event, maybe that would have worked better here with the F2000 also. Yes nice race with Waechter, but then i made a mistake. The guys in the front are very fast and they can manage the drifting better. For now i can't drive on this track like this, where the drift is very important. Thx. Don't know, if they are really much drifting (that would overheat and maybe also destroy the tires to early), maybe the setup is more refined to their style also. 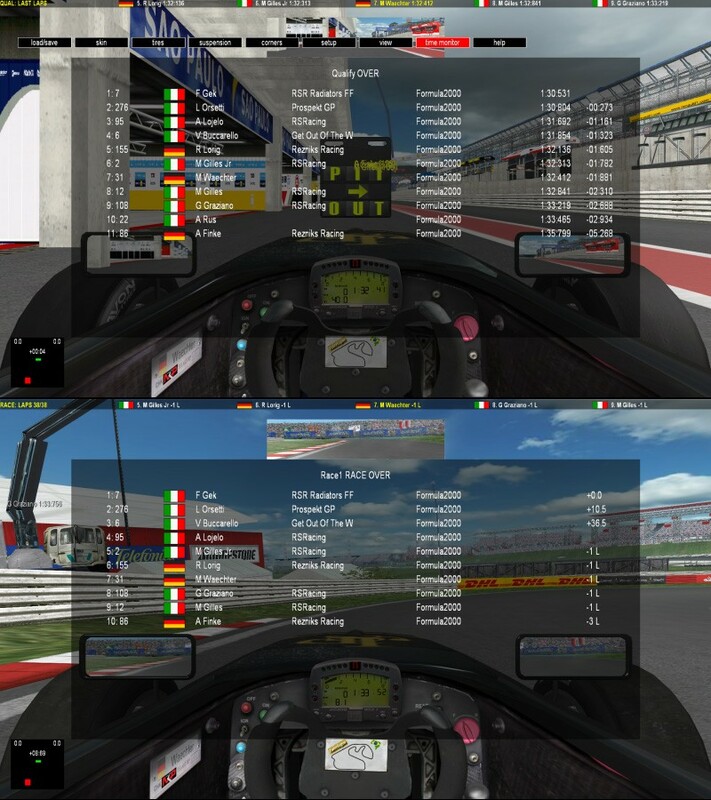 If you want to check out mine: I uploaded my F2000 setup, I used for the last race at Imola at waagenvoort.net/rank [ link ]. This set I also used at Interlaogs.., with just to the tracks topspeed adjusted gears and a little bit higher wings + a maybe bit more preload for increasing the ride high a few mm. As Marco said, drifting is absolutely not the right way to drive. if you're referring to my video, that is an unwanted oversteer that I saved by a miracle. I uploaded it just to show the comparison with a similar maneuver in reality to prove, once again, how realistic is netKar . Whether there will be a championship on open wheels? Ivan_Buranovsky wrote: Whether there will be a championship on open wheels? If it is not delayed too much.. . They are still working on some (new) features and options ready for v1.0 already -and else, referring to racedep. forum. But they will soon communicate even a fix release date among a list of all content/features.